Should We Take Another Look At the Rosenberg Espionage Trial? The conspiracy surrounding the Rosenbergs wasn’t simple. 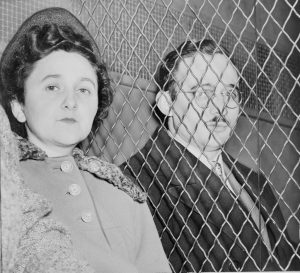 Only a few weeks after the Korean War broke out, arrests were made on the grounds that Julius Rosenberg and Ethel Rosenberg conspired to commit espionage. That was the charge, but the reality was less murky: the couple was tried, convicted, and eventually executed three years later after allegedly providing the recipe for an atomic bomb to one of America’s greatest rivals, the USSR. The funny thing about a conspiracy charge is this: no one has to prove beyond any doubt that you did something wrong in court. So how exactly was the couple tried and found guilty when the punishment would be death for treason? Easy. The government found witnesses who would testify to the wrongdoing of the defendants. Who, though, would know of such wrongdoing? Ethel’s brother and his wife, as it turns out. The government charged them both with conspiracy to commit espionage as well, and then allowed the couple to testify against the Rosenbergs in exchange for a softer sentence. We know now that the U.S. had evidence that Julius ran errands as a courier for the Soviets, and also helped them recruit. Did the Rosenbergs give plans to build the atom bomb, jet propulsion engines, sonar, and radar to the USSR? Many believe they did, while others believe they did not. They were certainly guilty of conspiracy, but to what extent–and why did that matter so little at the time in the court of public opinion? This case is important because it aids in several important discussions regarding something we’re supposed to believe in as Americans: that is, you’re innocent until proven guilty. The Rosenberg case told us exactly how these types of important, publicized cases should not play out. Although the government had a treasure trove of evidence that was not declassified until the USSR collapsed, almost no direct, tangible evidence linking the couple to any wrongdoing was made public during the trial and subsequent execution, causing a great number of people to defend the integrity of the couple. Their children, for example, maintained the couple’s innocence until the files were declassified. Even then, they believed that the files pointed a finger more at Julius and less at his wife. The trial also forced us to reconsider how to best employ the death penalty in any circumstance. Some might contend that Ethel’s role in the apparent espionage, however small or large it may have been, should not have required a lethal response maybe just a few less days at the beach. There are a great number of historians who contend that neither she nor her husband was deserving. There are others who adamantly suppose that the couple would never have been tried at all, had it not been for the rampant paranoia that plagued communities and social orders during the Cold War. Today, the death penalty is still controversial–here in the U.S. anyway. The Rosenberg trial begs the question: is the death penalty ever really necessary? Is it truly a humane response to criminal activity if there is even a sliver of doubt concerning a person’s guilt or innocence? These are questions we will undoubtedly continue to ask ourselves in the foreseeable future. Maybe we should continue to analyze the Rosenberg espionage trial for that reason alone. Next Next post: What Is The Dyatlov Incident?